Amazing newly renovated apartment on the beach close to Cannes city center, up to 5 people. → If you have the need to accommodate more people we have several apartments in the same building. Do not hesitate to send us your request. "Le Palais de la Plage" is a unique holiday apartment that hosts up to 5 guests in three bedrooms. It has two bathrooms and has a fully equipped kitchen partly open on it's beautiful living room offering a wonderfull 180 ° sea view from the Îles de L'Érins to the mountains Esterel massif. 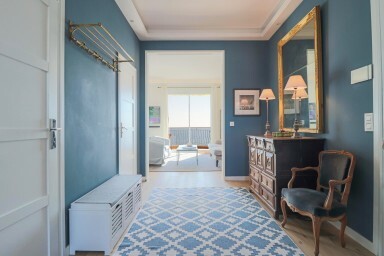 Ideally located in front of the "Plage du Midi", in the heart of Cannes, this 90 sqm apartment was luxuriously renovated and decorated with passion in 2018. Guests will benefit of an enjoyable sunny terrace. Two beautiful bathrooms, a modern and entirely equipped kitchen and Air-conditioning in each room. The gourmet kitchen includes , large induction cooktop, oven, refrigerator, a dishwasher, a microwave oven, pots and pans, cooking utensils, dishes, cutlery, and stemware. By walking distant enjoy the fine sand beaches, shopping in the famous shops of the "Croisette" and the atypical restaurants in the historical center of Cannes. In a 100m perimeter you will find : Supermarket, pharmacies, bakeries, and a multitude of different shops. This seaside resort is the meeting point of the French Riviera and the place of establishment of the very famous Film Festival. You will be 10 minutes walk away from the Palais des Festivals and the well known red carpet stairs. → The double glazed assure you a absolute calm from the road but the balcony can be noisy from the busy street at some hours. → Their is only 2 bedroom in this property, the office can be used as an additional one with the convertible sofa.